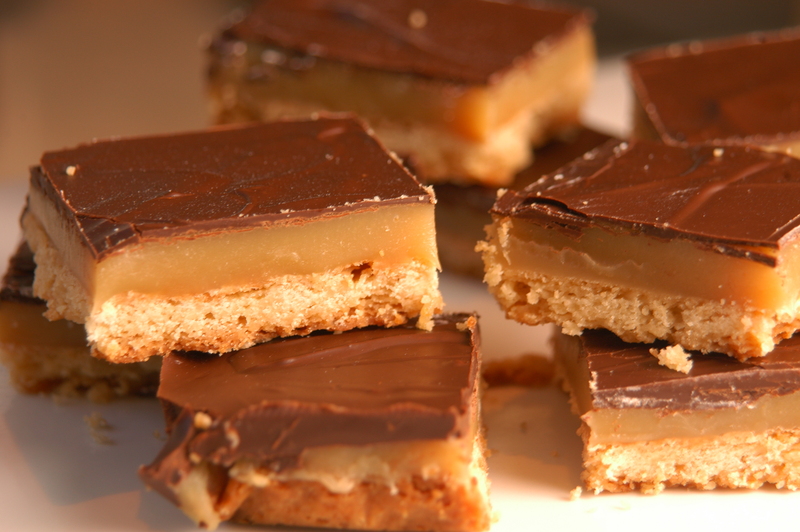 so I finally made millionaires shortbread! I have been reading about it lately and have been very tempted to make it. I sometimes shy away from bar recipes because they can be tricky to cut and can get really messy looking. this was my first go at these delectable RICH treats and they came out pretty good. I would have loved to have added nuts, but I want to make them for my sons school and it is a nut-free environment. but these need something. something to ease and cut the intense caramel richness. they ARE really yummy, but you can’t eat to much of them. I am tempted to fool around with them and add maybe pretzels underneath the chocolate layer. even potato chips would be yummy. something savory and starchy. maybe a combo of both? I found that it was easier to cut the squares after letting them set overnight in the refrigerator. also, golden syrup is a product found mostly in the UK, it is compared to our maple syrup. i used light corn syrup but may use a combination of dark corn syrup maybe maple syrup; i would have liked the color of my caramel to be a touch darker. Oh i love these bars. I sprinkle the tops w/ fleur de sel to cut some of the sweetness and add pop. I also burn (caramelize) the sugar in the filling before adding the other ingredients to give color and flavor. They look great! wow this looks amazing i just have to try it out real soon. im sure to come back and tell you how it came out! I add a little salt and oldfashioned oats to the shortbread for extra crunch.